First of all, two of the same sized oblongs are drawn on cardboard: The oblongs should be drawn at the required size of the picture frame. Then the frame is drawn inside one of the oblongs. The picture frame should measure approx. 1.5 – 3 cm. Now the two oblongs are cut out; with a craft knife and ruler for the best results. The inside of the frame of the second oblong is removed. Several oblongs are then cut from the aluminium foil. The cardboard frame is now covered in glue, the aluminium foil is attached and the ends are folded behind the reverse of the frame. 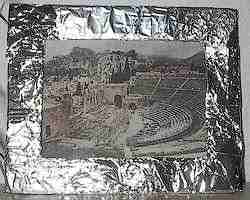 Once the whole frame is covered in aluminium foil, a piece of copper foil the size of the frame is cut out and stuck to the back of the frame. The picture /photo which is to be placed inside the frame is then stuck onto the second cardboard oblong. Everything is then fixed to the aluminium picture frame with sticky tape. The picture frame can now be hung on the wall or placed on the shelf.